Dorothy Braund was born in Melbourne in 1926 and studied at the National Gallery School, Melbourne and the George Bell School. A modernist artist, Braund was a student and associate of influential Australian modernists Alan Sumner and George Bell. Her travel studies in the 50s and 60s took her across Europe, Greece, Italy, Pakistan, Persia, and Turkey. Braund's restrained figurative style has, at its core, the natural world, people and activity, observed with distinctive wit and humanity. 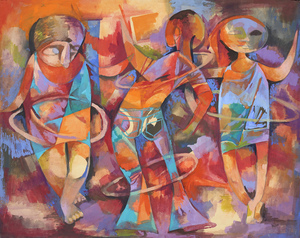 The subject is explored often through a series of works and refined and simplified. It is important to Braund to 'attain the ultimate in simplicity', through the play of light on black, white, brown, grey and other tertiary colours. Braund’s work is characterized by economy of means, rhythmic tension of line, close colour harmony, and subordination of the object, concentrating on form and design: the artist’s main vehicle of expression. Braund has exhibited extensively in the eastern states and is represented in several public collections including National Gallery of Australia, Art Canberra, Art Gallery of South Australia, National Gallery of Victoria and such Regional Galleries as Bendigo, Castlemaine, Langwarrin, and Mornington. Her work was represented in Classical Modernism. The George Bell Circle NGV 1992. Braund has been awarded Prizes in competitive exhibitions at Albury 1962, Colac 1964, Bendigo 1966 and Muswellbrook 1972. Through her extensive and prolific career, Braund was among a generation of influential women artists who have made a significant contribution to the period, including Mary MacQueen, Barbara Brash, Anne Marie Graham, Constance Stokes, Anne Montgomery and Nancy Grant.